Seventeen men from Market Rasen were killed in 1917. Gunner Charles AISTHORPE, Royal Garrison Artillery. He died of his wounds on 14th October. Charles was wounded in the face, legs, right hand and he had his right leg amputated. Charles was 24 years old, he had been working at Mr Lily’s sawmill when he enlisted. Gunner Fred BARR, D Battery 236th Brigade Royal Field Artillery. He was 30 years old when he was killed in action on 22nd July. Fred went to France in March 1915, he was a commercial traveller living with his sisters in Market Rasen when he enlisted. Corporal George BROWN died of his wounds a bullet in the chest on 23rd April. He was 24 years old. George was a corporal in 7th Lincolnshire Regiment. He enlisted in 1915 with his work mate from Market Rasen Brewery, Fred Page. Private John Henry CHESMAN, 2nd Lincolnshire Regiment. He was 33 years old when he was killed in action on 31st January. John enlisted in Grimsby in December 1915, where he was working as a dock labourer. He left behind a widow and three children. 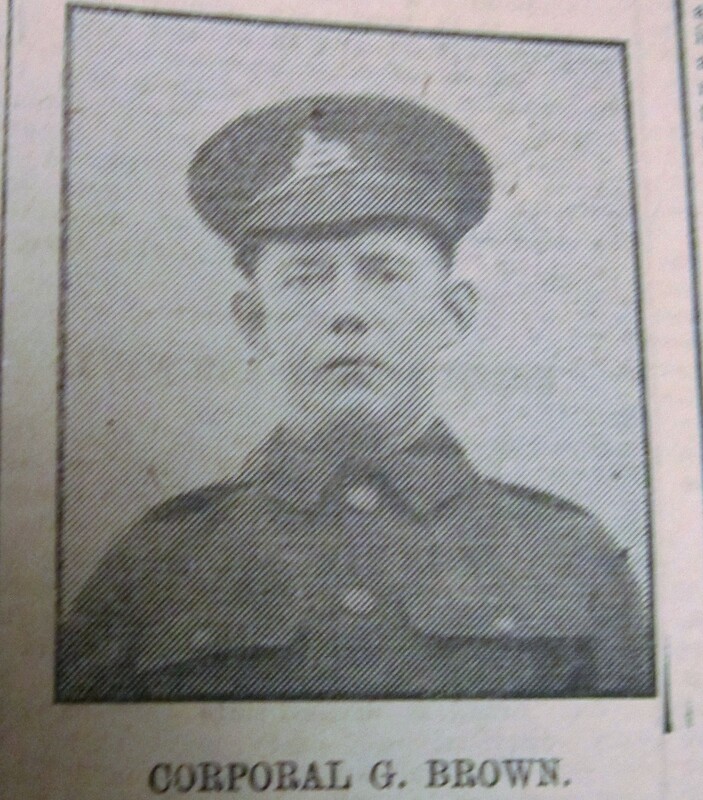 Private George Henry COOPER, Royal Fusiliers on killed in action on 4th August. He was 37 years old, he left behind a widow and daughter. He was the manager of Smith & Son’s bookstall (on the Railway Station platform). Company Sergeant Major Walter CREASEY, Royal Warwickshire, he was 31 years old when he was killed in action on 11th April. Walter was a postman in Birmingham when he enlisted in 1914. He declined a commission. He left behind a widow. 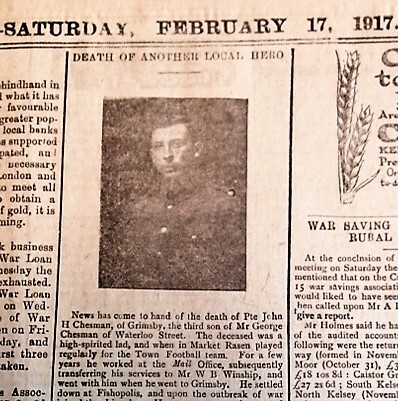 Private Fred KENNINGTON, Duke of Wellington’s (West Riding Regiment) was killed in action on 25th January. He was 30 years old when he was killed. Fred was a butcher’s assistant when he enlisted. Private Harry LEDGERD, 9thService Battalion, York & Lancaster Regiment. Harry was wounded in the abdomen and died of his wound on 24th September. He was 19 years old when he died. Harry was an iron monger assistant in Barnsley when he enlisted in 1915. 2nd Lieutenant Reginald Frank LOCKHART, 13th Kensington Battalion, London Regiment. Frank died of his wounds on 10th July. His father was until his death the Wesleyan Superintendent Minister for Lincolnshire which is why he is listed on Market Rasen War Memorial. Private John William LOWERY, 2nd/5th Lincolnshire Regiment. William was killed in action on 11th April. He had spent time in Ireland, and had been promoted to Lance Corporal and back again to Private. He was 21 years old and had been a carter for Mr Richardson, Coal Merchant. William had been reported missing. Private Hubert Taylor NETTLESHIP, 2nd Battalion Lincolnshire Regiment. Hubert was killed in action on 14th August. He was first reported missing, then confirmed killed. His father was also in France and spent time trying to find him. He is remembered on the Town, Wesleyan Chapel, St Thomas and De Aston War Memorials as well as the one in Ypres. Hubert was 20 years old when he was killed. Private Frederick John PAGE, 1/7th Battalion Lincolnshire Regiment. Fred was killed in action on 11th April, he was 24 years old. He had been a Clerk at Market Rasen Brewery and enlisted with his friend and workmate George Brown. In Autumn 1916 Fred had saved the life of another Rasenite Private Webb, who had been wounded. 2nd Lieutenant Harry Raymand RAWLINSON, 113th Battalion Machine Gun Corps (Infantry). Harry was 24 years old when he was killed in action on 26th September. He was working at a bank in Birmingham when he enlisted in September 1914. 10th May 1917 Harry became a 2nd and posted to the Machine Gun Corps. Lance Corporal James (Jim) Trevor SANDERSON, 5th Lincolnshire, was 23 years old when he was killed in action on 11th April. Jim was still classed as missing in November 1918. He was killed probability with William Lowery. 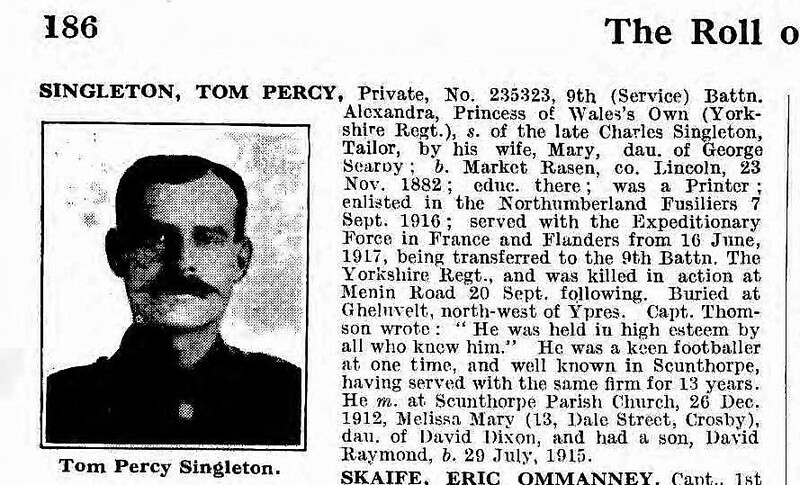 Private Tom Percy SINGLETON, 9th Battalion (Service), Yorkshire Hussars. Tom was killed in action on 20th September. He was 35 years old when he was killed, he had been a printer by trade. Tom left behind a widow and 2 year old son. Private Charles SMITH, 6th Battalion Lincolnshire Regiment, died on duty on 26th July 1917. Charles was born in Middle Rasen, but worked as a Maltster’s labourer in Market Rasen. He was married and had 3 children, Charles died of a heart failure in Belgium. He was 33. Private Charles William SMITH, 9284 2nd Battalion Lincolnshire Regiment, killed in action on 21st April 1917. Remembered on Thiepval Memorial, Somme, 1.c. The records state that CW SMITH was born in Market Rasen, Residence in Market Rasen and enlisted in Frodingham. Private James Walker, 9th Battalion. Loyal North Lancashire Regiment, he died of his wounds on 11th August. He was 30. He left behind a widow and child. James had been a wood turner before the war. Private John H Chesman, 2nd Lincolnshire Regiment. He was 33 years old when he was killed in action on 31st January. More information of these men and Market Rasen in 1917 can be found in the Rase Heritage Society’s booklet Market Rasen WW1 1917. Private Frank BELL, 1st Garrison Battalion Norfolk Regiment. He died on 3rd August in India. He is remembered in Burton- on-Trent. Private Harold BROOK, King’s Own Yorkshire Light Infantry 1/5th batt. Died 29th March 1917 in France.His name is on the war memorial at at Jude’s Church, Hexthorpe. Private Walter SANDERSON, RASC and (died)was lost at sea on 5thMay 1917. His name is on the Doiran Memorial in Greece. He was 35 years old and a father of 4. Private Fred WILSON, 1st Battalion Bedfordshire Regiment. He was killed in action on 23rd April, remembered at Grimsby? Life in the town was reported by the Market Rasen Mail.